This is a photo of Nelson House, Nelson Township – proprietor M. S. Atkinson. The photo is from the Atlas of the County of Halton, 1877, photographer Rolph Smith & Co., Toronto. For those not aware, Nelson was situated in the vicinity of Guelph Line and Dundas Street. The two churches, Nelson United Church and St. Johns Anglican Church, were part of the life of the village of Nelson. 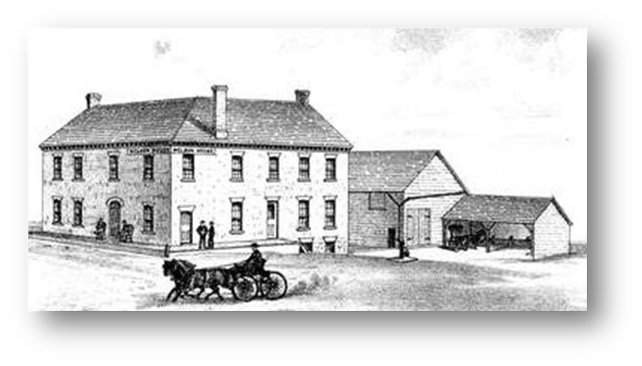 Built in 1853 on the southeast corner of Dundas Street and Guelph Line on land donated by Stephen Atkinson, Nelson House served as the township hall and was the venue for many agricultural fairs. It was later a hotel owned by Moses S. Atkinson. In 1897 the Literary Society was given permission to hold meetings there, “providing they clean it up after and be responsible for damage”. The hall footprint dimensions were 60 by 120 feet. Demolished in 1974. The hamlet was named Hannahsville by Caleb Hopkins, after his wife Hannah Green, but was renamed Nelson by British veterans of the Napoleonic War. The following description was written by Hazel C. Matthews in “Some Inns and Taverns in Halton County”, available at Oakville Library.